If you’re interested in having a deck awning installed on your home, then look no further than Sunesta, pioneer of the retractable awning industry. Since 1981, we’ve been a leading name in awnings and outdoor comfort, and today we provide a wide variety of awning styles and have the largest selection of fabrics in the industry. Aside from the obvious benefit of creating a shaded oasis in your own backyard, there are many other reasons to have a deck awning installed at your home. Wall-mounted awnings that shade a home’s windows in addition to the deck, for example, provide the added benefit of reducing utility costs by shading the home’s interior, making it easier for the home’s HVAC system on hot days. Sunesta Awnings are also attractive and sure to improve the curb appeal of any home. In addition, when you purchase a deck awning from Sunesta, it will be custom manufactured to fit the exact measurements of your space. Your awning will also be given its own SmartCode‚Ñ¢ identification number, which will allow us to provide you with personalized service if you ever need assistance. 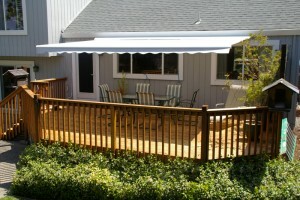 For more information about having a deck awning installed at your home, please contact us today by calling 1-800-SUNESTA.